MoMo 2.0: A call to action! I have really struggled A GREAT DEAL since this summer when all the new Immigration Points Systems were put into place in Denmark. I loved the idea of "earning points" for the things we do in our daily lives here as a way to support our application for permanent residency after the 4 year mark. However I did not love the idea of using the points to KEEP FOLKS OUT of DK... especially the ones who married a Dane and are told they are not welcomed to live her. Mads and I have had many conversations about this and what can be done.... like TRULY DONE. Not just waiting for the election and hoping a new party takes control and not just complaining with other people who feel the same way we do. But a REAL CALL TO ACTION. I just finished a unit with one of my classes on the Cambodian Genocide and their culminating writing task was their personal understanding of the "roots of genocide" and how small things that we overlook or condone can end up (as history has shown us time and time again) in the exclusion.... deportation.... extermination of millions of people. No, Denmark is NOT on the brink of a genocide. But when I look at what experts (AND MY STUDENTS) have identified as the fundamental "roots" that have grown into genocide after genocide in the 20th and 21st centuries, I see more similarities than I am comfortable with. and a reason to act. But I am committed to making a positive contribution to the community in which I live... and for right now, that community is Herning, Denmark. I live here. I love Denmark. I speak (more and more) Danish. I learn all I can about this country that I call home. 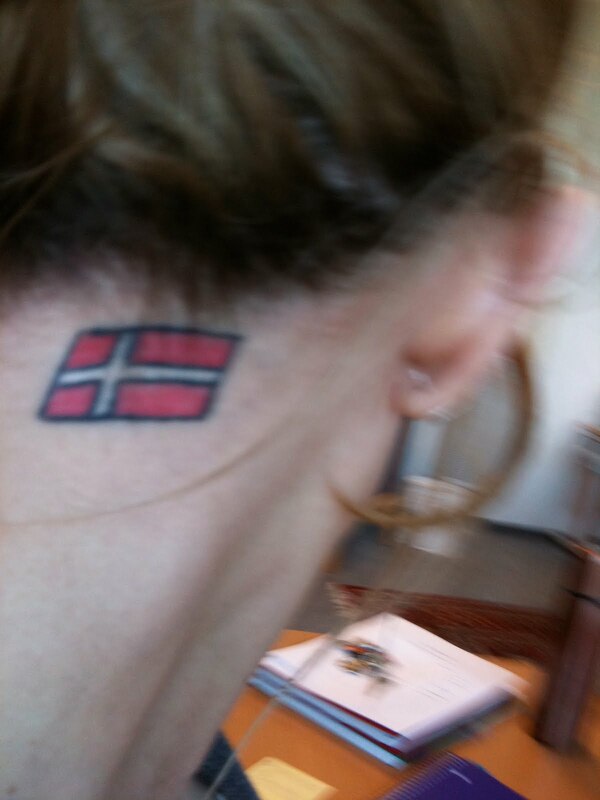 I honor the Danish traditions and customs while at the same time honoring my own. And most importantly, I recognize that the awful people who are saying the awful things do NOT represent the Danish people as a whole. So my hope is that as I pause...and then find some way to act to make a positive change in MY community of Herning, Denmark, that other foreigners as well as Danes who are as outraged as my Viking is will do the same. Until we say no more, we are in essence not only allowing, but condoning the name-calling... Dr. Angelou reminds me that we must speak up. Amen... as always extremists do not usually represent the majority. But we do need the majority to speak up. As far as I remember, you were actually quite excited about the point system. I actually gaped in shocked when I found out how happy you were about it - not knowing that there were MANY PEOPLE out there who wouldn't be able to get it when they weren't lucky enough to hold a job like you or to have a life like you. I loved the idea of "earning points" for the things we do in our daily lives here as a way to support our application for permanent residency after the 4 year mark. However I did not love the idea of using the points to KEEP FOLKS OUT of DK... especially the ones who married a Dane and are told they are not welcomed to live her. I STILL welcome the idea of a person seeking permanent residency to "prove" what he has done to meet the requirements of the integration contract. And the point system is a way to do that. That point system for permanent residency is not at all the same thing as points to keep people OUT OF DK in the first place. and I am not LUCKY to have my job and my life... I have worked to CREATE BOTH from the moment I arrived here and I think it is my DUTY AS A HUMAN BEING to work to create the life I want. Do you know why I say LUCKY instead? Because there are a lot of other (coloured) foreigners out there who tried their might to find a job but denied simply because of their colour, their names and many more. Finding a job here isn't about NOT being lazy. You are LUCKY because you are from US and you're white. I say that again. I'm lucky that I get a decent job here. My friend from Kenya? NOT SO LUCKY, because despite the Danish university degree he has, he hasn't found any in the past 3 years, and now tell me how he could get a permanent residency? What about women who just want to come to Denmark to be with their husbands and kids? Who just want to be housewives? Now it's suddenly impossible to do that, if you want security in the form of permanent residency. Is it no longer a choice to be a housewife in Denmark? What's wrong with that if she doesn't cost a kommune a cent? This is why I was shocked to find YOU excited about the rules JUST BECAUSE You were able to get it. It doesn't matter that others couldn't get the residency, as long as YOU CAN. That's how I see you. Did the tattoo give extra points in the point system calculation? Just curious whether it helps show your connection to DK. I know of many who have worked very hard to get a job, are incredibly well qualified and still were not "lucky" enough to get one. Opportunity is not just created, sometimes other factors conspire with you to make it happen. I, for one, feel very lucky because I know there has been a mountain of blessings involved in my ability to live the life I live in THIS particular country as a woman of color. Also, I think you misunderstand this point system. Of course a point system is always made to exclude a group of people. You don't create a point system to let people in. Instead, you let them in. That was old Denmark, one none of us who just moved here within the last 9 or 10 years ever really experienced. Folks can argue amongst themselves as to whether the open door system was any good, I don't really care to get into that one. I do know that a stringent point system, such as this one, has one purpose only and the number of approved applications (in the single digits) since its implementation tells that story quite obviously. It's nothing to be happy for. It will limit Denmark's ability to keep up with the world and it will keep loved ones apart or force them to move. DK will be left with the bottom of the barrel. Aside from that, this incessant discussion of racist policy and these caricatures of politicians who issue one insanely discriminatory statement after another, distract from the dire economic realities that will eventually roll DK into its grave. I would put money on the fact that this "system" has no legs. It will not exist one generation from now. And that's just math, not based on my disheartening experiences here or my distaste for many of the "values" that I feel they are attempting to shove down my throat. As for equal opportunities I don't deny that some etnic groups get discriminated against. But it definitely doesn't help to give up and let rage and resentfullness win. I have lived in a couple of different countries and it hasn't always been easy to find a job and footing, but I kept trying and eventually suceeded. I was DETERMINED to focus on the positive things in the country I was living in, instead of all the negativity. And "Only in DK", I am really unsure why continue to read my blog when all it does is "upset" you... I don't write these posts hoping that all of you will come out of the woodwork again, hoping to spur on some great debate. So if you are looking for one, you came to the wrong place. But I will clarify one last thing.... I don't "like the points for P.R. because they were written for a person like me..."
not because I am white, but because I am involved in my community, serving in groups with Danes and with foreigners, passed my Danish exam, use the language in my daily life, have a job, etc., etc,...you know, all the things I (and all others here for Fam Reun) vowed that I would do when I signed that Integration contract. Would you still have time to volunteer on the side? Would you not get home all tired from the physical jobs from morning to the evening? There have been so many criticism about the point system that I found it so shocking that you thought it was the right way to integration. Do you know how many people out of 500 to get permanent residency under the current point system? 5. Why is it so difficult for you to see that the point system is created to put a stop for immigrants from getting the residency permit. Look at other surrounding countries, no similar rules applied in Sweden and Norway. Someday maybe you'd realise that no matter how much you try, work hard, you'd still get kicked out the country just because of a simple mistake like renewing residency like what happen to Loren Neufeldt. I really would want to see if you end up getting permanent residency anyway. I don't know about "Only in DK", but if I'm included in the "all of you". I can say that I come back and comment in hopes that other readers will consider my perspective and put it into their basket of other opinions they might have read on other blogs, politiken, berlinske, or CPH Post. Especially those that don't read Danish. I comment knowing that you personally will probably not consider my point of view seriously. It's become such a hostile place. I remember it 15-years or so ago, just as refugees were beginning to be granted asylum. It was apparent at the time that they were unwelcome. Since then, it has escalated to a point in which the country is in a moral panic about foreigners. I have never, in all my travels, encountered anything approaching the levels of fear and intolerance coming from the people, the media and the politicians. I figure that my spouse and I will be able to get out of here within in 2-years. I am so looking forward to that day. Well said Tina. I hope the Danish people will hold on to their culture and their laws and not sucuumb to this criticism. I wish the United States was stronger in that regard. Foreigners move here and some choose to integrate while holding on to things near & dear to them....while others spend all their time trying to change our lives and our laws and expect our country to to "fit" for them. I often wonder if their home country was so wonderful why they have chosen to leave. I do not believe in discrimation of any sort, but I also do not think others from outside the country should dictate how we live. Sorry Mom, I usually agree with you but on this one I have to disagree. U can't say that one person works harder than another when you don't know them, who they are, what they stand for, where they are going, what they have been through , or what they are trying to do. I worked in housekeeping as my first job in DK and it is very very hard work. I also did my part to integrate and follow the rules. I got up at 3 in the morning to bike to work in all weather to get there by 4 then worked until 6 am biked back home, got dressed and biked to school 30 minutes away. After a day of school i biked back home did some studying and then went to my next jobs that would last until 10 at night, come back home, eat, study then get to bed at 12 or 1 to wake up again at 3 to do it all over again the next day. Yet I still found time on the weekend to speak and learn danish, spend time with my danish friends and family and form a connection. Not only that I owned a cleaning company after graduating from university there. I was working all day and night and weekends. If someone quit , mostly danes, because they would rather earn govt money then work and do the job right then I would have to go in and work til 3 in the morning....along with having a child and working with an expat group in Aarhus and keeping my customer happy and sane. The people who did a good job cleaning and stayed were foreigners who worked many many job, went to school, had kids, and were also a part of the community and spoke danish. So that part is were I disagree about people not integrating because I have seen that most do and try and get the shaft in the end. Just because someone has a different job does't mean they work any harder or less than another person at another job. In cleaning you are constantly on your feet, getting critiqued, getting sore, bending over, constantly in motion, and constantly getting bitched at by the customer and your boss. And yet you still want more jobs because you want to be a part of society. Same as a business owner plus. I did everything that was expected and you will never ever be Danish and they know that and will never let you forget. WELL SAID TINA!!! A BEACON OF LIGHT IN ALL THE UNFRIENDLY HATERLYNESS. If you don't like it here, then why stay AND complain? It seems like if YOU hate it so much, then you should leave. Why are you still here when you find so MUCH to complain about? You COULD go somewhere else, where you will find nothing to complain about. I don't hate it. I came here because I love my husband and he was too scared, at the time, to uproot himself and move to NYC. I will say that I feel a responsibility, for whatever reason, to help these folks figure out what year they are living in. Multiculturalism is a train moving at the speed of light with no brakes, it is THE REALITY. There is no way around it. They are preparing their children for failure by fiercely protecting their bubble instead of figuring out a way to best prepare for the rolling and rapidly shifting results of globalization. I would like my kids to be able to come back to DK on visits and not look at me saying "Mom, what age are these people living in?". Better yet, I would like them to be able to visit DK, period. I would like to know that they won't be descriminated against for having a mom with a different colored passport. Kelli, I have no doubt whatsoever that you work hard. Still, that does not mean you're not fortunate for being American, English-speaking, middle class, non-Muslim and white. This means you're not discriminated against in the same way many other foreigners are, and it means there's a lot of prejudice these people have to fight that you don't have to fight. For this reason, your effort has been able to build you a life here, while others have not succeeded even though they put up a similar and even greater effort - because of the prejudice I mentioned. You should recognize that you're privileged and that your fortunes can partly be explained by this privilege. You get to teach, while several Iraqis and Iranis drive around in taxis, PhD in engineering or no PhD engineering. Because in a time of unemployment, the few available are all to often given to white Danes. And Tina: No, people who live here and don't like it should NOT just leave or shut up. They should stay and speak up. If we won't listen to criticism, how will we ever improve? It makes me very sad that you are American and believe so much in censorship. Especially since you've been in the school system! Have you banned books also? If people aren't being attacked, threatened, or verbally abused, and you choose not to publish the comment, that is censorship and you should be ashamed to call yourself American. Actually you being in denmark works out better for America. Please get citizenship as a dane as soon as possible. You fit right in there. Dreaming in Danish,Only in denmark, Agger, and Aubrey thank you for speaking up. It needs to be heard and I wish I had known what I do now before I moved here. Kelli you're getting there and I'm glad you are speaking up too but, you don't quite get how hard it is here for people who don't have your education, skin color, hair color, spouse, physical ability, or money.It does make a difference.